While the original lime and mint mojito is a timeless classic, it’s fun to change it up once in a while and add a pop of flavor. 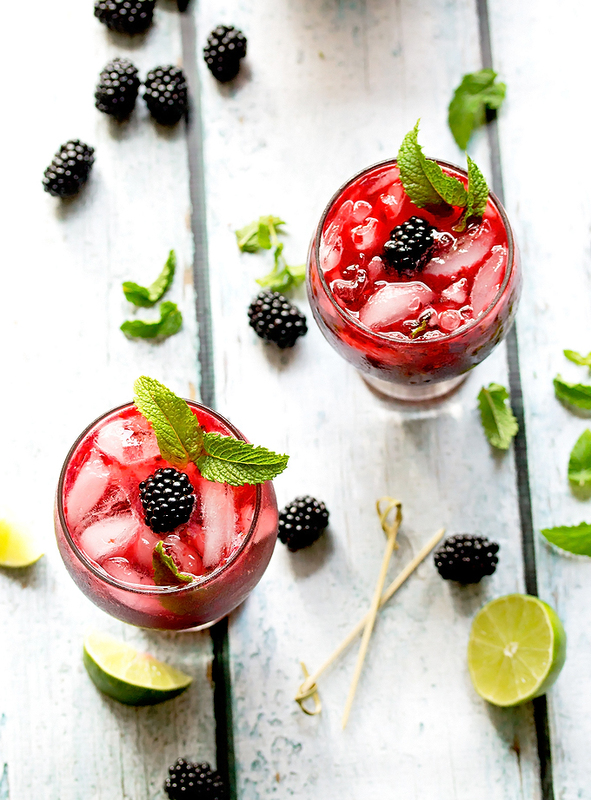 Debbie and I originally made our massive batch of blackberry simple syrup for this mojito, because we LOVE mojitos, but also ended up making Blackberry and Peach Sangria with it as well as a Blackberry and Rosemary Margarita (spoiler alert!). The syrup and this mojito were so good that we just had to keep creating new cocktails with it. Debbie says that this is her new favorite mojito and it’s probably mine too. 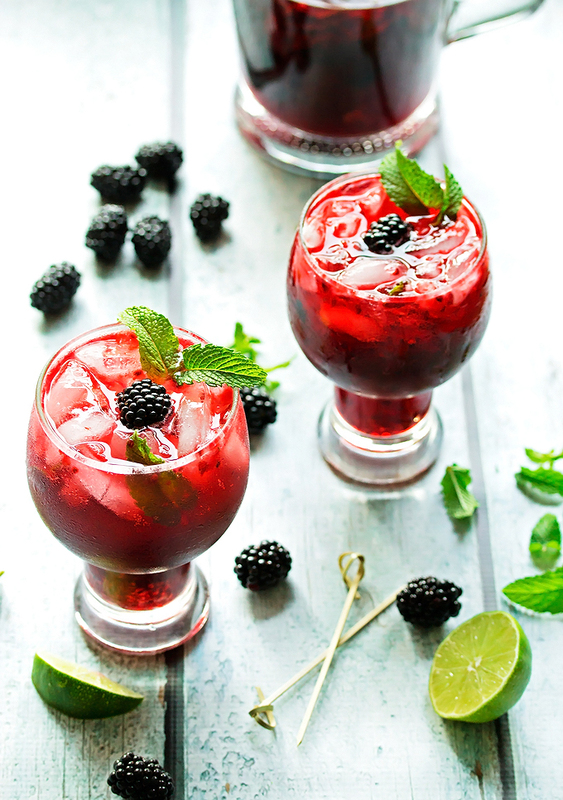 It’s got that extra bit of sweetness from the berries, but the fresh mint and lime juice still shine through and create an amazing aroma and flavor. And they look absolutely gorgeous too with that dark juicy red color. Debbie and I made a pitcher of these when we mixed them up. Mojitos are a little more time consuming to make than some other drinks, with all the muddling and all that, so we often make a pitcher so we only have to muddle once. Our pitcher recipe will make about 5 cocktails so hide if from people who want a mojito, but don’t want to make the effort to muddle it themselves! Grrrrr. Unless they help with the first muddle, of course! Alright, so I have some big news! Kevin and I have sold our house. Its official! It’s exciting and scary and stressful all at the same time. I’m looking forward to purging and getting rid of stuff that we don’t need. It’s amazing the amount of stuff that a few people can accumulate in 2 years! And I’m looking forward to change because change can be a good thing. But I’m also a little apprehensive because we are moving at the beginning of October but we don’t have a place to live yet! I know that will work itself out, but it feels a little uneasy at the moment. We only planned to stay in the house for a year while we renovated it, but ended up staying for 2. We love it there, but it’s part of the plan to move on to bigger and better. Have a great weekend everyone and have a mojito! First make the simply syrup. Put all the ingredients into a medium pot and bring to a boil. Turn the heat down to medium and simmer for at least an hour or until the mixture reduces and starts to thicken up a bit. It doesn't need to be too thick. Set aside to cool. 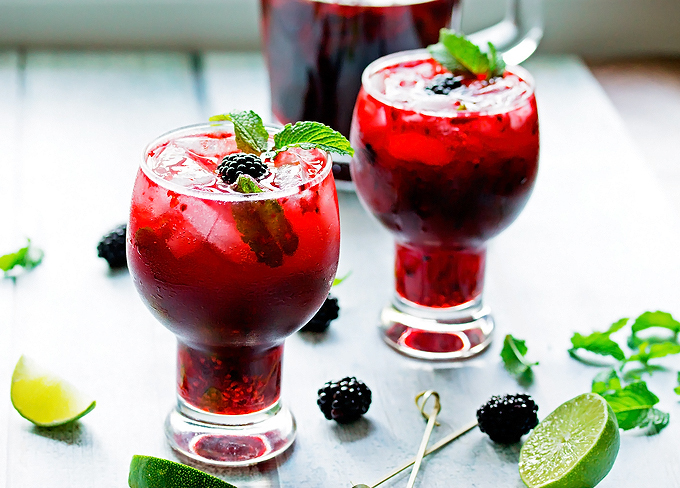 When you are ready to make a mojito, add the blackberries, rum, lime and mint to a glass and muddle well. You will smell the flavors all mix together. Next add the blackberry syrup and give it a little stir. Fill the glass with ice and then to the top with club soda. Stir well, garnish with a lime wedge and a sprig of mint and serve. 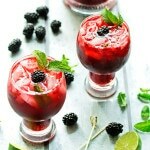 Add the blackberries, lime, rum, and mint to a pitcher and muddle it well. 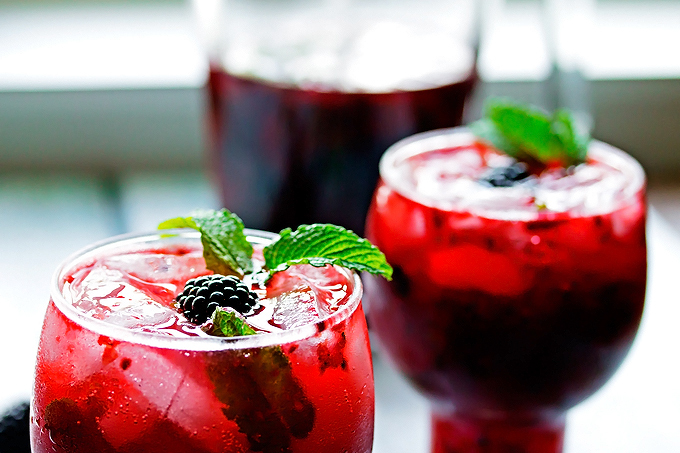 Add the blackberry syrup and give it a good stir. When you are ready to have a cocktail, fill a glass with ice, pour 4 oz of the mixture into the glass, top with club soda, garnish with a lime wedge and sprig of mint and serve.